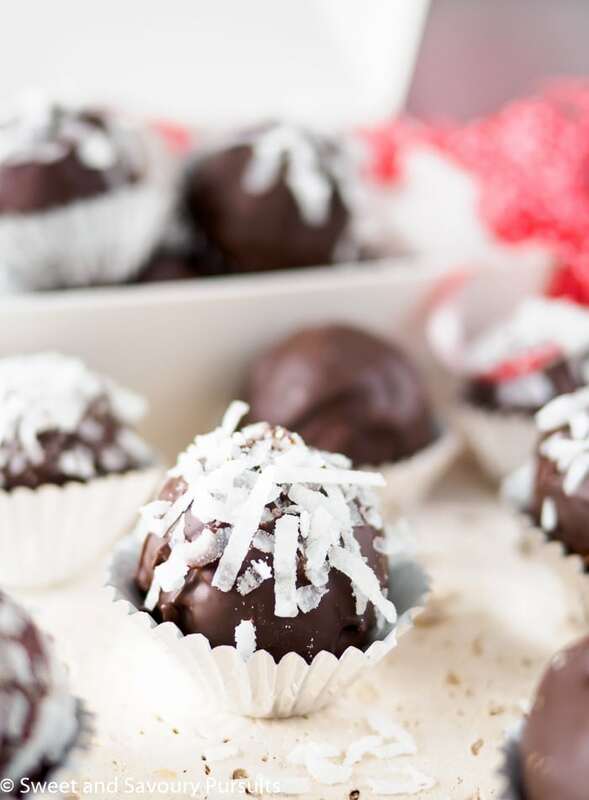 These Double Chocolate Coconut Almond Truffles are delicious tender sweet bites of coconut and white chocolate covered in luscious dark chocolate. Made with coconut, almonds, light flaky wafers, sweetened condensed milk, and white and dark chocolate, these truffles are irresistible. These ingredients taste so good together it’s no wonder there are so many delectable creations incorporating them. 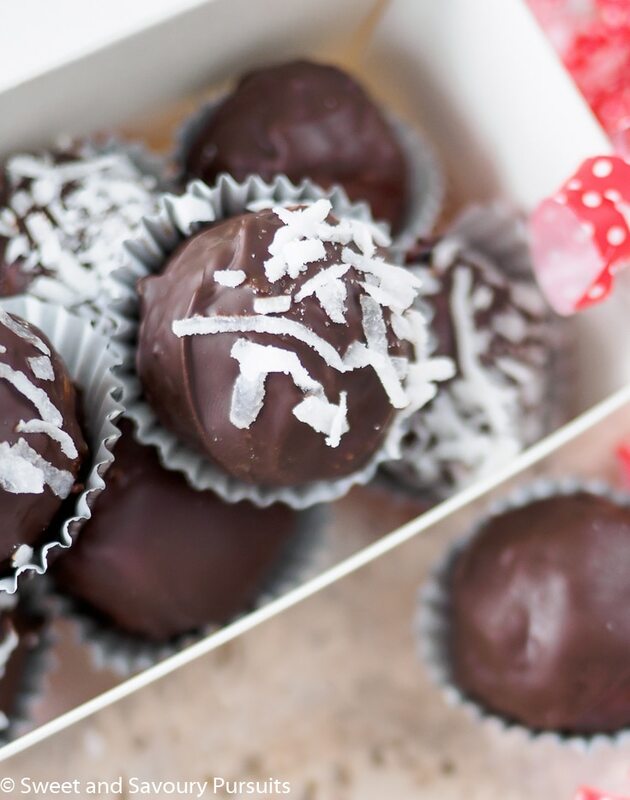 Luckily, these Double Chocolate Coconut Almond Truffles couldn’t be easier to make at home. These are by no means your traditional truffles made with chocolate and heavy cream, rather they’re a combination of tasty ingredients made to stick together by adding sweetened condensed milk and melted white chocolate. The ingredients used in this recipe are pretty straightforward but you could make a couple of substitutions if your missing some of the ingredients. The toasted almonds could be replaced with toasted and skinned hazelnuts and you could also substitute the wafers with graham cookie crumbs. These Double Chocolate Coconut Almond Truffles are tender and chewy, full of delicious coconut and chocolate flavours. My favourite part is when you reach the centre of the truffle and you are greeted by the crunch of a perfectly toasted almond. 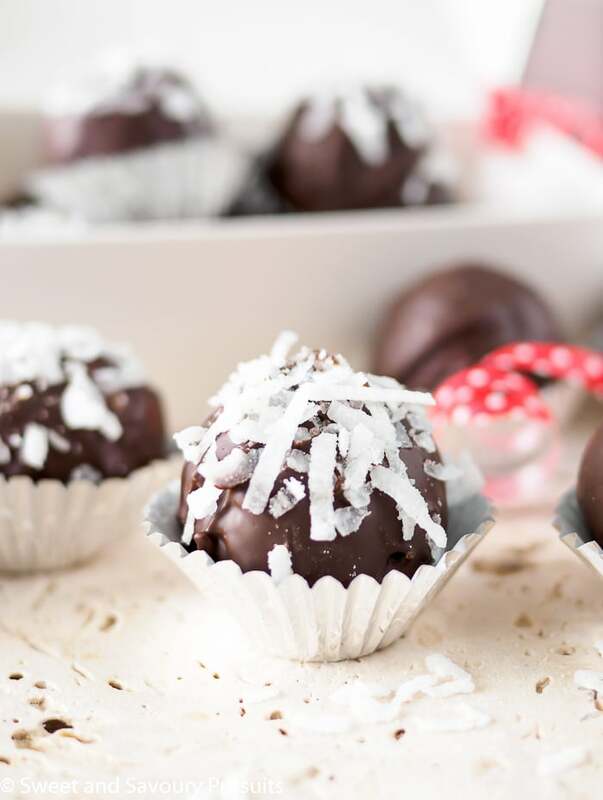 My pickiest taste testers gave these Double Chocolate Coconut Almond Truffles two thumbs up, so I know this recipe is a winner for kids and adults alike. Enjoy! In a double boiler, or in a pan set over simmering water, melt the white chocolate. Once melted, stir until smooth. To the melted white chocolate add the sweetened condensed milk, coconut oil and almond extract, mix well. Add the crushed wafers to the white chocolate mixture and combine until blended. Add one cup of the coconut to the white chocolate mixture and mix in. Test to see if mixture is too soft by forming a ball in your hands, if the mixture is still too soft add up to a 1/3 cup more of the shredded coconut and mix well. Let the mixture rest in the refrigerator for about 15-20 minutes. Line a baking sheet with parchment paper, set aside. Remove from the refrigerator and using a teaspoon or small cookie scoop (I used a size 60 scoop), scoop out mixture, start to roll mixture in your hands into a ball but before completely finishing, stuff an almond in the centre and pinch the ball to close the opening and then continue rolling until you have a nicely formed ball. While shaping your truffles, melt the dark chocolate in a double boiler over low heat. When chocolate starts to melt stir it with a spatula, turn off the heat but keep your bowl over the warm water so that your chocolate stays nicely melted. Using a fork, dip each truffle into the chocolate, remove and place onto baking sheet. Repeat until all truffles are done. If desired, sprinkle truffles with dried coconut. Place baking sheet in the refrigerator to set the chocolate coating on the truffles, once set (takes about 30-45 minutes), place each truffle into a mini paper cup. To preserve truffles, layer them in a container between parchment paper and store them in the refrigerator for up to 1 week. Let truffles come to room temperature before serving. *Place sheets of wafers in large plastic bag, and roll over bag with rolling pin until wafer are crushed. Hi Fida! 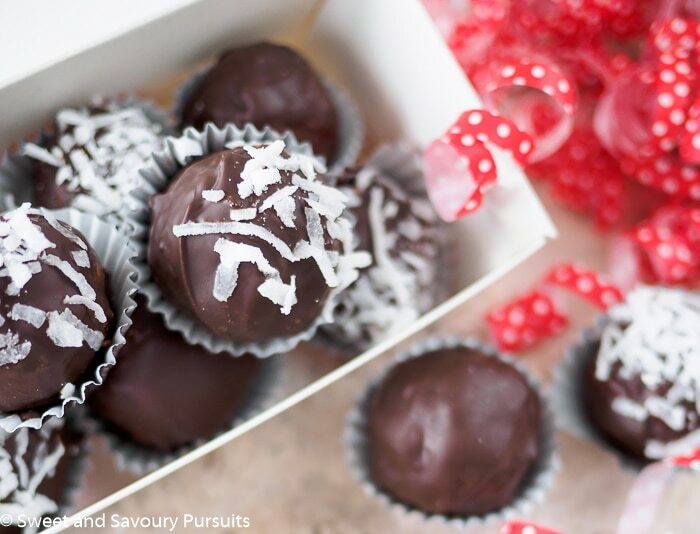 These double chocolate coconut almond truffles look absolutely divine 🙂 Your recipe sounds pretty simple too. I would love to try these out in my kitchen. Thank you Anugya and thanks for sharing my recipe with your facebook group, I’ll take a look at it soon! Pleasure is mine! 🙂 See you there! I always enjoyed Mounds and Almond Joys when I was young. These truffles sound like a delicious combination of flavors very similar to both if they were combined. Love them. Yes, in fact they do taste similar, chocolate, coconut and almonds are so scrumptious together! It looks amazing and delicious 🙂 Thanks for sharing a recipe ! Fida, these are beautiful little bon bons, perfect for Valentine’s Day. Thanks! Thanks Louise, I couldn’t believe how easy they were to make and so delicious!